| An unexpected surprise that surpasses even my expectations. A bizarre yet excellent paranoia thriller that takes place in a swamp in the Louisana where eight National Guard members who are on a routine reconnaissance excerise, unwillingly and intentionally start an exhausting battle of wills and survival with some Cajuns who know the swamps like if their own backyard. Director Walter Hill ("48 Hours", "Undisputed") and his screen-writers (David Giler and Michael Kane) have unveiled an expected surprise that surpasses even my expectations of a top-notch thriller. The trio have borrowed the backdrop from one of those not-so-smart slasher movies like "Friday the 13th", then change the location of the story to the Louisana Bayou, and give the viewer characters that we may like. As for the cast, Keith Carradine and Powers Boothe emerge here to give the best performances. 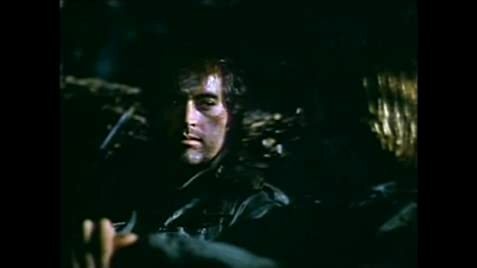 Boothe is good as Hardin, who came to the unit as a transfer from Texas while Carradine is the relatively easy-going Spencer. Fred Ward and Alan Autry also deliver here as two members who are both troublesome in two different ways. Ward is the bully who doesn't need much to provoke a fight with anyone and Autry is the emotionally shell-shocked soldier whose fragile feelings are rocked when the unit's leader, Sargeant Poole (Peter Coyote) is unexpectedly shot and killed. Some of the locals that the team run into are either harmless or polite instead of being stereotyped. However, the Cajuns that are seeking revenge are about as hard to find as the shark in the first half of "Jaws". Even a few of the Hill regulars: musician Ry Cooder, photographer Andrew Laszlo, and production designer John Vallone add another key element to the movie. The look, the feel, and especially - the music fit the atmosphere like it should be and I was satisfied with that. Plus, the movie ads for "Southern Comfort" don't lie here and what happens in the film shows very clearly why. The production shoot for this movie went for nine weeks with cast and crew working six day weeks. Simms: Hey Spencer. What about company command? They should be wondering about us, don't you think? Simms: We've been out of contact for 12 hours. Cpl. 'Coach' Bowden: He's right. They should be looking for us by now. Within one sentence, Sgt. Casper describes his unit as both a "squad" and "Team Bravo" (meaning a fire team). It could be either a small squad or a large fire team, but not both. A platoon generally consists of three or four squads, and a squad generally consists of two fire teams. A fire team consists of roughly four to six individuals, and is the smallest infantry unit in the Army. Published by Flat Town Music Co.